During the Civil War the Confederates built two ironclad steamers at Wilmington — the CSS North Carolina and the CSS Raleigh. Benjamin Beery and Brothers built the North Carolina at their “Confederate Navy Yard,” or the “Navy Yard” on Eagles Island, across from Wilmington, while J. L. Cassidey and Sons built the Raleigh, at their shipyard at the foot of Church Street in Wilmington. The Richmond-class ironclad North Carolina, begun in July 1862, remained nameless until October of that year, when S.R. Mallory, secretary of the Confederate States Navy, instructed that the ship be named the North Carolina. Built for the Confederate government in accordance with the specifications issued by chief naval constructor John L. Porter, the North Carolina was the largest ship built by the Beery brothers. It measured 150 feet in length, 32 feet in beam, had a depth of 14 feet, and only 800 tons burden. Nearly all of the wood used in the construction of the ship was fresh cut or “green.” The hull was partially constructed of pine, and the upper works of heavy oak. It was stated that the ironclad steamer had a draft of 13 feet – too deep for crossing the bar and was primarily intended for river defense. The North Carolina was expected to be completed by October or November 1862, but strikes, shortages, and a yellow-fever epidemic postponed the launching of the vessel for several months. The guns, railroad iron plating, and engines for both ironclads under construction had to be produced at the Confederacy’s only iron rolling mill, the Tredegar Iron Works in Richmond, VA. Instead of waiting for the engine to be built for the North Carolina, Captain Beery was able to locate an engine from another vessel that could be installed in the ironclad. At the beginning of the war Wilmington seized the tug Uncle Ben and removed the engine. 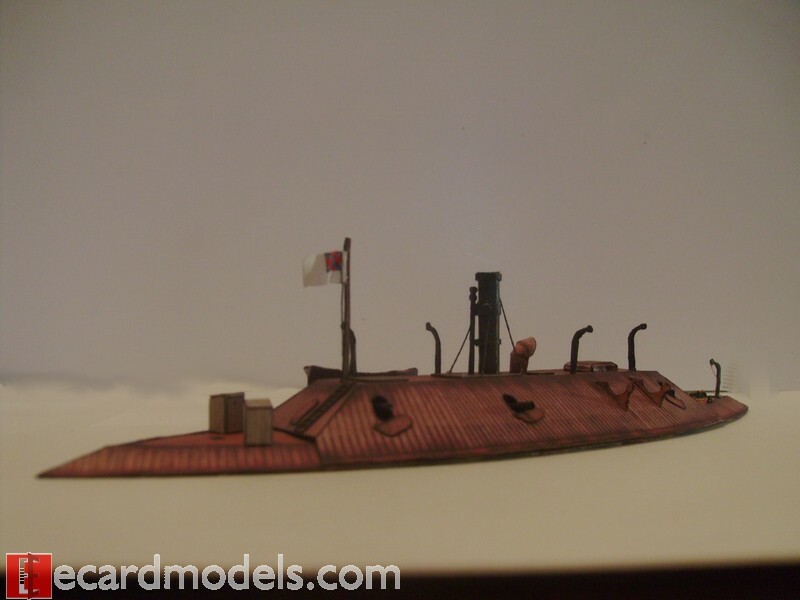 Although the engine from the tug proved inadequate for the larger ironclad, it was better than having to wait for the Tredegar Iron Works to build one. Nearly complete by the spring of 1863, the North Carolina still lacked guns and what would prove a costly omission – lower-hull copper sheathing. There was very little copper to be found in the whole Confederacy in 1863, and the sheathing had to be omitted from the final plans. The specific armament of the North Carolina has never been determined. Most Richmond-class ironclads were designed to carry two 7-inch and two 6.4-inch Brooke rifles. Both the bow and stem guns were on pivots, able to turn to either broadside to fire. The other two guns were placed at midships on either side of the vessel. That arrangement gave the Richmond class a three-gun broadside potential. Although the Wilmington ironclads were meant to carry, four guns, they may have carried only three, primarily to conserve weight. Before the ironclad was finished, the navy loaned to General Whiting at Fort Fisher two Brooke 6.4-inch rifles. When the North Carolina was ready to be launched, General Whiting returned the guns. The third gun was probably a 7-inch Brooke rifle. 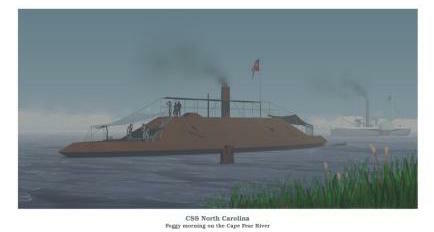 The Confederate Navy placed the ironclad steamer North Carolina in commission during the later part of the year with Capt. William T. Muse in command of a complement of 150 men. Unable to cross the bar for ocean duty and subject to breakdowns of its old engine, the North Carolina was involved in little action. It was moored at Smithville [Southport] as a guard ship for the lower entrance to the Cape Fear River. The ironclad spent most of its entire career at Smithville, where it was subject to progressive deterioration below the waterline from teredo worms because of its lack of sheathing. Lieutenant William B. Cushing of the US. Navy stated in June 1864 that the ironclad “is but little relied upon, and would not stand long against a monitor.” In April Capt. William Maury temporarily replaced Capt. William Muse, who had been overcome by typhoid fever. When Captain Maury was then stricken with “acute Rheumatism,” Capt. John Pembroke Jones became the final commander of the North Carolina. Jones spent the majority of his time overseeing the “fitting out of a blockade runner” in Wilmington, and the ironclad North Carolina quickly deteriorated during the absence of its captain. Finally, in September a 1864, the North Carolina sprang a leak while anchored in the river. A year after the sinking of the ironclad, Stephen Bartlett, a US. surgeon stationed aboard a ship at Southport, wrote home to his brother about visiting the partially submerged wreck: “Tell Walter I fish from the Rebel iron clad N Carolina which is sunk near us but most of the decks are out of water”. In the spring of 1868 the Navy Department contracted for the removal of the remaining iron plating from the North Carolina; In late June “some fifty tons of iron, stripped from the ram North Carolina,” was sold at public auction for 2 1/8 cents per pound. Three years later the wooden remains of the old ram North Carolina were intentionally burnt to the water’s edge. During late 1863, the Confederates laid down the second ironclad, the steam-powered ram Raleigh at the wharf near the foot of Church Street in Wilmington at the J.L. Cassidey & Sons Shipyard. That Richmond-class ironclad, built to John L. Porter’s plans, was similar to those of the CSS North Carolina, and 150 feet in length stempost to sternpost and 172 feet overall, with a 32-foot beam and a draft of 12 feet. Two thicknesses of iron plating, or casemate, covered a heavily constructed wooden hull, and formed a ram at the how. The Confederate Navy commissioned the ironclad Raleigh on April 3, 1864, under Lt. John Wilkinson, and shortly thereafter placed it under the command of Lt. J. Pembroke Jones. The vessel’s compliment numbered 188, and her armament consisted of four 6-inch rifled cannons. The engine for the ironclad may have been removed from the wreck of the blockade-runner Modern Greece, while another source claims the engine was new from Richmond. On the evening of May 6, 1864, the ironclad left Wilmington and steamed toward the bar at New Inlet accompanied by the wooden steamers CSS Yadkin and CSS Equator, to engage six vessels of the Union blockading fleet. With the smaller steamers under the protection of the guns of Fort Fisher, the Raleigh was successful in briefly breaking the blockade that evening, allowing a blockade-runner to escape. Fighting resumed the following morning and by 7:00 AM. the Confederates broke the action. While attempting to cross back over the bar at the inlet, the Raleigh grounded, “breaking her back” on what was known as New Inlet rip, a narrow and shifting sand strip. By the following morning the water had reached the Raleigh’s gun decks. The severely damaged vessel was salvaged of her guns and abandoned. Randall described the condition of the wreck and salvage work in progress: “She was very much sunken at the stern, lifting her bow considerably. Her sides had been stripped of their armor, the smokestack prostrate, and altogether she had the appearance of a monstrous turtle stranded and forlorn. As we passed, the divers were engaged in removing her boilers and machinery”. Contemporary accounts reported that the “guns, equipment, iron, etc.,” were “being saved.” The salvors, unable to refloat the ironclad, removed the two boilers and destroyed the vessel. The navy sent the boilers to Columbus, Georgia to be used in the steamer Chattahoochee. In July Capt. William Cushing reported, visiting the site of the wrecked Raleigh, that nothing of the vessel remained above water. The wreck was indicated on navigation charts of New Inlet for many years. In April 1868, the schooner L. Waring, laden with 3,000 bushels of corn, ran upon the sunken ironclad while passing through New Inlet. The ship’s crew made efforts the following day to lighten the schooner and save her from sinking. By late May 1868 the schooner had been raised and repaired at the Cassidey Brothers shipyard . The Raleigh was partially salvaged again in 1881. A Wilmington newspaper provided the following account of that operation: “Mr. Horton, was cruising in that neighborhood [the rip off New Inlet] a day or two since, when they came across some obstacle on the bottom, whereupon Capt. Loring, an experienced submarine diver, donned his suit and went down, placing two kegs of gun powder in the midst of the obstruction and setting it off. The result enabled him to ascertain that it was the wreck of a vessel, and he next placed a thirty-five pound package of powder under the wreck and blew it apart, when a portion of the sunken gunboat, which proved to be the front of the turret [casemate], was brought to the surface, hitched on to the schooner and brought to this port, where it was dropped on the railway at Capt. Skinner’s yard and hauled up out of the water. What’s the story on the Confederate Shipyard on Eagles Island? 1959 “Blockade Busters That Failed.” The State 27, no. 15 (December 26, 1959): 9-12. Murray, Paul and Stephen Russel Bartlett, Jr.
1956 “The Letters of Stephen Chaulker Bartlett Aboard U.S.S. Lenapee, January to August 1865.” The North Carolina Historical Review 33, no. 1 (January): 66-92. Official Records of the Union and Confederate Navies in the War of the Rebellion (ORN). Series I and II. Washington: Government Printing Office. Official Records of the Union and Confederate Armies in the War of the Rebellion (ORA). Washington: Government Printing Office. “Letters and Papers of Charles Smith Peek, Acting Third Assistant Engineer”, CSS North Carolina. Typed transcripts in the possession of Dr. Charles Perry, Charleston, South Carolina. 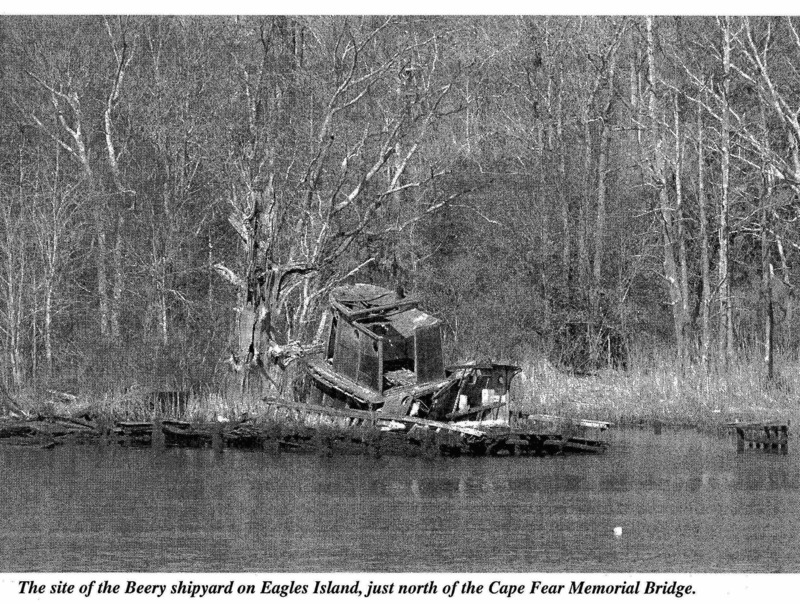 1973 “Shipwrecks of the Civil War“. Washington DC: Donic Ltd.
Williams, Isabel M. and Leora H. McEachern. Wilmington Daily Journal (Wilmington, NC.) 1864 (Bill Reaves Historic Newspaper Collection). Wilmington Dispatch (Wilmington, N.C.) 1919 (Bill Reaves Historic Newspaper Collection).